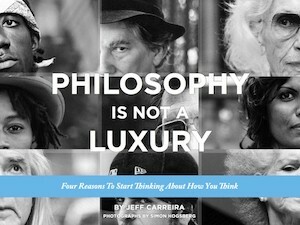 Home » Crash Course in Western Philosophy » Why Does the World Exist? We are here. That much seems clear. We can’t deny our own existence. Well actually great philosophers have denied our existence. What we can’t deny I suppose is that something exists. There is an experience of existence, of being, that is undeniably the foundation of everything. If nothing existed there would be nothing to contemplate existence and no existence to contemplate. In his new book, Why Does the World Exist? Jim Holt tackles the existential question of why there ‘is’ anything in the first place. Why did anything happen? Why didn’t nothing happen? Some philosophies east and west will tell you that everything that we experience as real is an illusion. Especially in Eastern philosophies they will say this is all a dream. All this physical stuff, including my body is not really here. My entire story and the drama I appear to live through everyday never happened. My thoughts and emotions are nothing. It is all, they will say, the play of pure conscious. Pure being is all that really is. Everything else is an illusion created in an ungraspable field of consciousness. Even if we were to go that far in our own beliefs we could still wonder why consciousness exists at all. Why is there not simply nothing? Why does anything at all exist? To tackle such a question the first thing you need to examine is the nature of existence itself. What does it mean to exist? What does it mean to be? To be or not to be, that is the question. Philosophers through all ages have tackled this most fundamental question of existence. What does it mean to exist? How do we define the state of existing? Or to put it in more everyday terms, what counts as something rather than nothing? If you skip this question, which many people do, you arrive at the doorstep of existence. You are here in the midst of an experience of reality and there is lots of something to be understood, categorized, analyzed and interpreted. This is one of the things that philosophers do. Descartes for instance looked out and said there are two main categories of existence – physical and mental. Some things extend physically like doorknobs, basketballs and human feet. Other things only exist in the internal realm of the mind like my love of chocolate, my understanding of calculus, and my memory of yesterday. So for Descartes everything was either mental or physical and then there are lots and lots of subcategories and fine distinctions to be made. Scientists took the realm of the physical and started using the methods of experimentation to make finer and finer distinctions. Psychologists followed suit in the realm of the mental. But all of these endeavors happen after existence. They assume existence – which is a useful assumption to make – and then work with existence. Jim Holt wants to pause a moment and examine the nature of existence itself. In doing this he is following in the path of the philosophy call Existentialism. Many of us have heard of Existentialism and probably have a number of associations with it. At heart it revolves around the question of existence. What does it mean to exist? What is the nature of being? When I say something ‘is’ what am I actually saying about it? What actual information is contained in the statement that ‘something is’ versus that it ‘is not’? These are the questions that Jim Holt says have driven him since he was a child and in his book he promises to share his own journey of discovery in this domain. I for one am reading the book with great enthusiasm and will share with you what I find as I continue with it.